Google has just released a new web based GIS App, Earth Engine. It let's you play around with a lot of environmental data including Landsat images, NDVI. 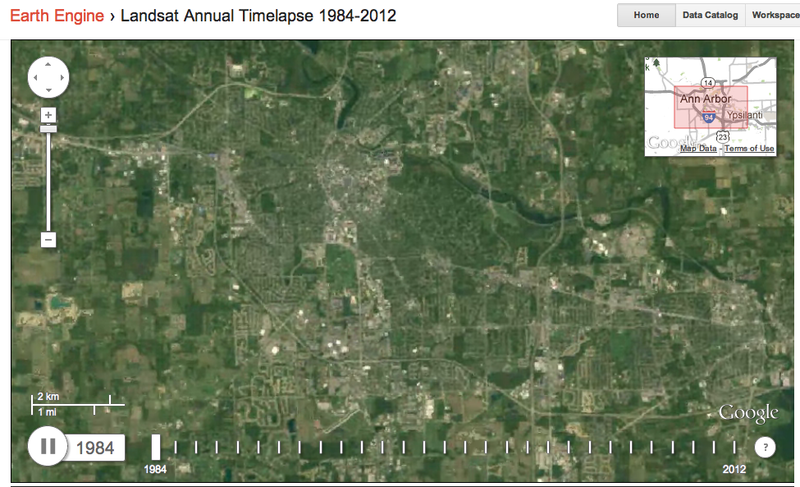 If you click here, you can see a timelapse of annual Landsat pictures of Ann Arbor from 1984-2012. The biggest thing I notice is the rapid growth of northwest Pittsfield Township starting with the Meijer on Ann Arbor Saline. Anyone know what the best GIS application is to use on the iPhone web browser interface, safari? I’ve seen a few that seem to work, but we keep losing functionality on certain tools.